Many moons ago, the lovely Tara (you should check out her blog - For Your Random Knowledge) came over for dinner. She cooked stuffed cannelloni, then we cracked open another bottle of red wine and set to work making whoopie pie. 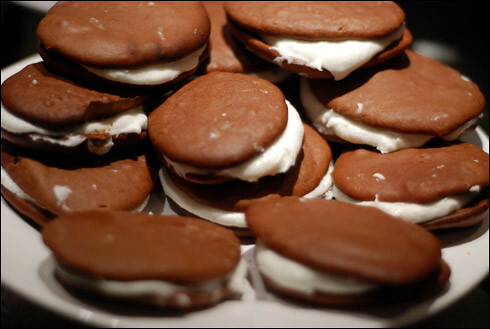 Lots of whoopie pie. The recipe itself is from an Amish cookbook, and is truly amazing to look at - it is entirely handwritten. I've adapted the recipe for a predominantly UK-based audience (though the original quantities are in brackets next to the metric amount) so those without cups can also have a go. This makes approximately 64 5cm sandwiches - 32 whoopie pies. Preheat the oven to 200°C, then cream together the sugar and butter, then add the eggs. Sift in the flour, cocoa powder and salt, and beat the mixture together (I used a Kitchenaid for this). Slowly add the buttermilk while mixing, then add the vanilla essence. Put the baking soda in the hot water and pour into the beating mix. Line 2 baking trays with greaseproof baking paper, and then spoon six dessertspoons onto each tray. Bake in the oven for 8-10 minutes. If, like me, you don't have an industrial oven and unlimited trays at your disposal, you'll need to bake the sandwiches in batches. It took me 5 turns. Place each batch of sandwiches onto a cooling rack, and then when done make up the filling: using a bowl placed in a saucepan of boiling water, gently beat together all the ingredients until the sugar has dissolved and the mixture is opaque. Transfer to a Kitchenaid and beat over a high speed until it is thick and holds its shape. Scoop a generous amount of the filling onto the flat surface of the cooled whoopie sandwich and top with another sandwich.